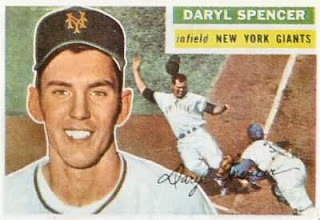 Daryl Dean Spencer was born on July 13th 1928 in Wichita, Kansas. The six foot two right handed infielder, known as "Big Dee" was a local boy all the way. He attended East High in Wichita & Wichita State University as well. He had his contract purchased by the New York Giants in 1950 & got a late season call up, for seven games with the Giants in 1952. In 1953 he played behind Hank Thompson at third, Alvin Dark at short & Davey Williams at second base. He got into 118 games and showed a lot of power with 20 HRs 18 doubles & 56 RBIs but only hit .208. On May 4th he hit a grand slam HR off the Reds Clyde King, as New York beat Cincinnati 12-5 in the Polo Grounds. On June 3rd, he hit a pair of HRs in a big 11-3 win over those same Reds. Two weeks later he had another two HR day against the St. Louis Cardinals. From July 23rd through July 5th he hit five HRs & drove in ten runs. At the end of July, Spencer had yet another game where he blasted two HRs. 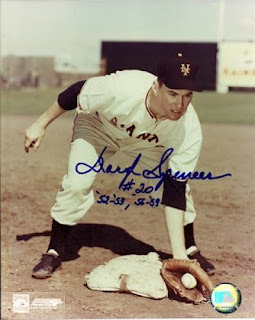 He was drafted into the Military serving two years in the Korean War, missing the Giants Championship season in 1954. He returned in 1956 replacing Alvin Dark as the regular shortstop over the last two seasons the Giants played in New York. He had double figures in HRs both seasons, with a career high 31 doubles in 1957. 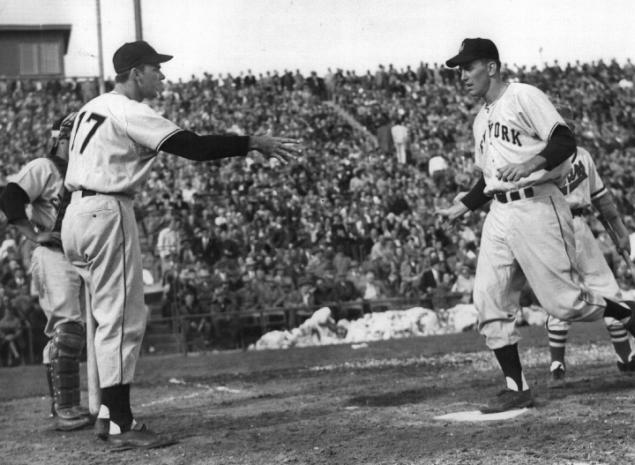 Spencer would also be in double figures in HRs for seven years, from 1953-1956. He would lead the league in errors for two straight seasons but was among the tops in turning double plays as well. He played in the Giants last game at the Polo Grounds going hitless. On April 15th he became the first Giants player to hit a HR in San Francisco, as he hit a solo shot off Don Drysdale in the first game ever played on the West Coast. The Giants won it 8-0. That year he adjusted well to the West Coast, driving in a career high 74 runs, hitting 17 HRs with 20 doubles batting .256. After the 1959 season he was traded to the St. Louis Cardinals with Leon Wagner in exchange for Don Blasingame. In 1960 he was the Cards main short stop, making the second most errors in the league. In May he was traded to the Los Angeles Dodgers for Bob Lillis & Carl Warwick. He would be the Dodgers main third baseman in 1961 & 1962 until Ken McMullen took over in 1963. That season he was released by L.A. & went to the Cincinnati Reds where he ended his career, after being released on his birthday. In a ten year career he batted ..244 with 901 hits 105 HRs 145 doubles 20 triples 428 RBIs & a .327 on base %. On the field he played 558 games at short stop, 322 games at second & 222 games at third. Overall he made 203 errors turning 563 double plays with a .958 fielding %. 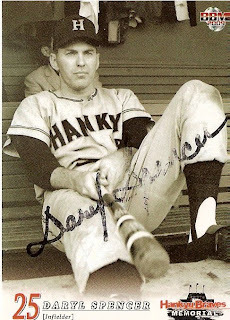 Japan: After playing in the majors he went to play seven seasons in Japan with the Hankyu Braves, winning four pennants. He came close to winning a batting title just .009 points away, but did lead the league in walks once. His hard nose style of base running helped change the way Japanese players stole bases & how catchers handled pitch outs. At the time he set a record for foreign players in Japan hitting 142 career HRs. Retirement: In 1969 he retired from baseball, then opened a restaurant in Wichita. He went back to Japan, as a player coach getting to two more Japan Series', finally leaving the game in 1972. Back at Wichita he managed a National Baseball Congress team & worked in public relations for the Wichita AA ball club. 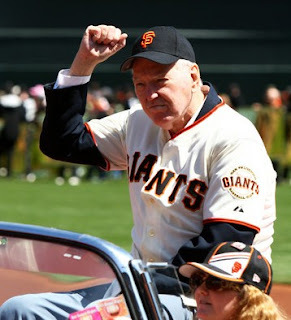 He returned to the Giants in 2008 for the 50th Anniversary of the club in San Francisco.